"Hogs & Pigs" report data came in above analysts' pre-report estimates. The U.S. Department of Agriculture's National Agricultural Statistics Service issued three livestock reports on Dec. 23. The December “Cattle on Feed” report showed that Dec. 1 feedlot inventories were 98.6% of last year's level, down about the same amount as last month on a year-over-year basis. November placements were up 15% compared to one year ago, slightly above average pre-report estimates but not a big surprise for markets, according to Oklahoma State University Extension livestock marketing specialist Derrell Peel. The report also showed that November marketings were up 16.6% from last year, in line with pre-report estimates. Peel noted that November 2016 had one additional business day compared to last year, which accounted for about 5% of the increase in placements and marketings. Peel said the data suggest that feedlots have pulled cattle ahead, setting up relatively tighter first-quarter 2017 feedlot supplies, particularly if winter weather should affect feedlot production in any significant way. “That does not change the fact that feeder supplies will be larger in 2017 and more cattle must move through feedlots in the months ahead. The cattle and beef market supply challenges will continue highlighting the need for strong domestic and international beef demand to moderate larger beef production in 2017,” he said. USDA's latest “Cold Storage” report showed that November cold storage holdings of beef were 4.1% above last year's levels but were also down fractionally from the record levels of October. Peel explained that cold storage holdings typically increase during the winter, so the buildup this fall was mostly seasonal. 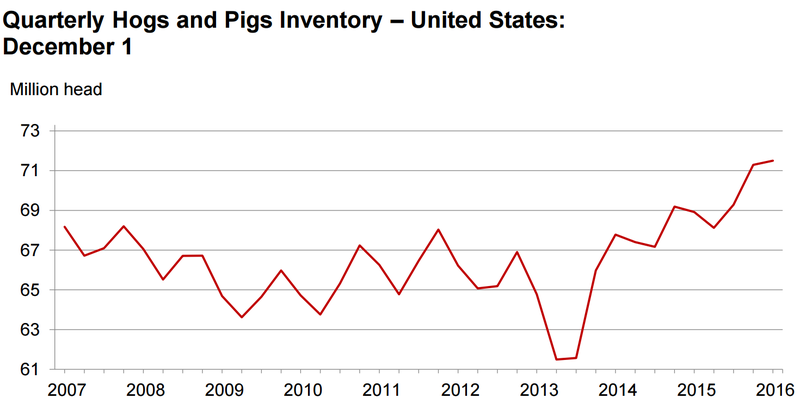 The third report released by USDA was the quarterly “Hogs & Pigs” report, which indicated that hog supply and pork production challenges will likely continue into 2017. 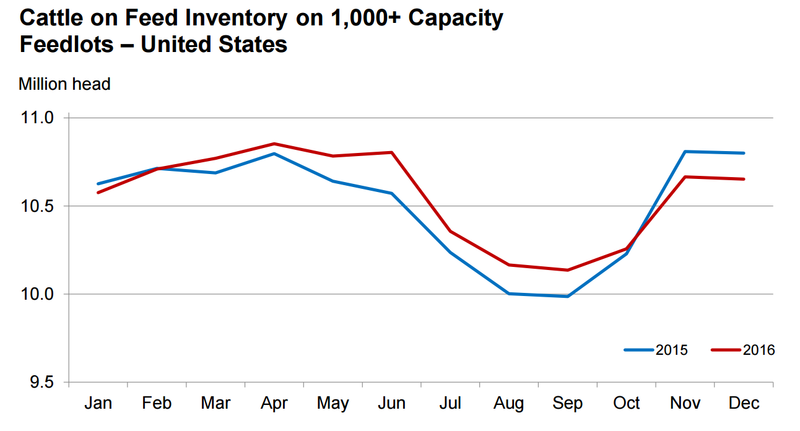 The Dec. 1 inventory of all hogs was nearly 4% higher than last year. Breeding hog numbers were also higher, at 101.5% of last year. There were 4% more market hogs than last year. All categories were above pre-report estimates, which Peel said will likely provoke a bearish market reaction. “Estimates of the September through November pig crop as well as the farrowing intentions through May of 2017 were all above expectations. This may push 2017 pork production estimates even higher and will add to the supply pressures in all meat markets in the coming months,” Peel said.